Transportation construction contractors have done more work in the first three months of 2014 compared to the same period last year, according to the latest Value of Construction Put in Place data from the U.S. Census Bureau. 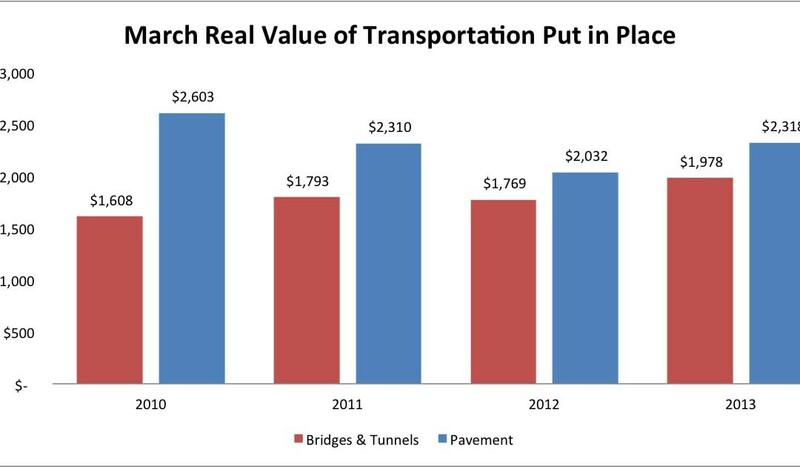 The year-to-date value of overall transportation work increased by 7.5 percent in the first quarter of 2014 compared to the first quarter of 2013, and transportation work done in March 2014 was up 11 percent compared to March 2013. Highway contractors completed just over $2.3 billion in ongoing construction work in March 2014, compared to $2 billion in March 2013. Construction activity in the bridge market was $1.9 billion, up nearly 12 percent in March 2014 compared to the previous year. Other modes also showed growth in the first quarter of 2014. The real value of construction work on railroad projects was up 10 percent, while the value of subway and light rail construction activity through March 2014 showed flat growth compared to March 2013. Airport work was down two percent. Due to some large ongoing projects, the real value of construction work for ports and waterways was up 18 percent in March 2014 compared to March 2013. The overall market in 2014 will depend on a variety of factors, including uncertainty over the federal aid program and the Highway Trust Fund, as well as the continued recovery in state and local finances and the U.S. economy. Detailed data by month and mode is available as part of ARTBA’s market subscription reports. Contact ARTBA’s Lital Shair for more information.